Personal preference is to use a pump oil can with a pipe cleaner thing from a craft shop inserted in the spout with little bit sticking out to use as a brush or to drip on to the workpiece. My exotic approach for the small amount I do is using one of my wife's empty hair colour bottles with the tube from a WD40 can inserted snugly through the cap. I used to fill the bottle with a mixture of 30W oil and Kerosene 25/75 approx. In use, I upend said bottle, gentle or not so gentle squeeze to get the amount I want and start work. I also sometimes just let the heat of my hand expand the air inside the bottle and achieve a drip feed when parting off. Lately I have begun using, "Angels Breath tapping fluid" because I made some up and A, it works ok and B, it stinks better. Still, as has been stated previously, it was the joy of making the Tuna Oil tub that was the aim of Joules in his original post. Oh, and Angels Breath does work well as a tapping fluid. Strange, as that was its intended use. Best tapping fluid if you get get the ingredients is 3 parts trike to one part ATF or similar hydraulic oil. I have tried the mist systems before but don't like them on many fronts. One is my compressors are quite large and if I only need to run one for a mist system it's expensive and wasteful. As the pressure fluctuates, so does the delivery and it;s a very fine line to get it right, if you can. lastly working with largish cutters for a long while with mist causes a fig in the air that you are breathing, not nice and certainly not good for you. I'm working on a positive pumped system using a small geared DC variable speed motor driving a Peristaltic pump. These can give as much as you like or as little and be very consistent, something I have found every coolant system I have come across to lack. John, there are some nice little gear pumps used by the model jet engine people. Whilst the pumps are expensive they can meter very accurately and upto high pressures. If only someone could cut small accurate gears. Oh yeah, fog on the Tyne is fine all fine, but not in my bloody workshop. No rush, use a brush. The mister was something Bogs made many moons ago, a simple nozzle, he then blasted air through it & used the differential pressure to pick up tiny amounts of some fancy cutting fluid. I call it a mister... it didn't leave a visible fog, just a few drops "condensed" onto the part being cut. I suspect the air did the majority of the cooling, the fluid just adding a little lubrication. A 2- stroke Suzuki 125cc dirt bike oil injection pump driven by a 12vdc auto power blind motor works great on my ORAC lathe retrofit. Post #13 in the link: http://www.machsupport.com/forum/index.php/topic,22258.msg177119.html#msg177119 Easy & cheap! If the trike you are referring to is trichlorethylene, my recollection is that it can be rather nasty to your health. Especially if you smoke whilst using, something about vapours and the heat of the fag. Banned for lots of uses now. I used it in combination with a sulphated detergent to concoct very effective grease remover early days in the textile industry. (Back in the days before safety data sheets.) It worked when all else failed to remove grease stains from the fabric. So good that it stripped the skin off one bloke's hands after he ignored my thrice repeated warnings to make sure he wore gloves with the stuff. Got the grease stains out though, and he got a few weeks off on compo. I use something like a fogbuster http://www.fogbuster.com/ (I made a few many years back).
. Fairly quiet, no mess, no breathing the stuff. and I have it wired to come on with the mill or lathe spindle (if it's enabled by a switch). I'll try to find some pics..
Made a second one for other lathe. With what I learned from the first can, I soldered the reinforcing wire to the underside of the lid. Don't really know why I didn't do it the first time round. How much space did you leave between the bottom of the tin and the underside of the tube? 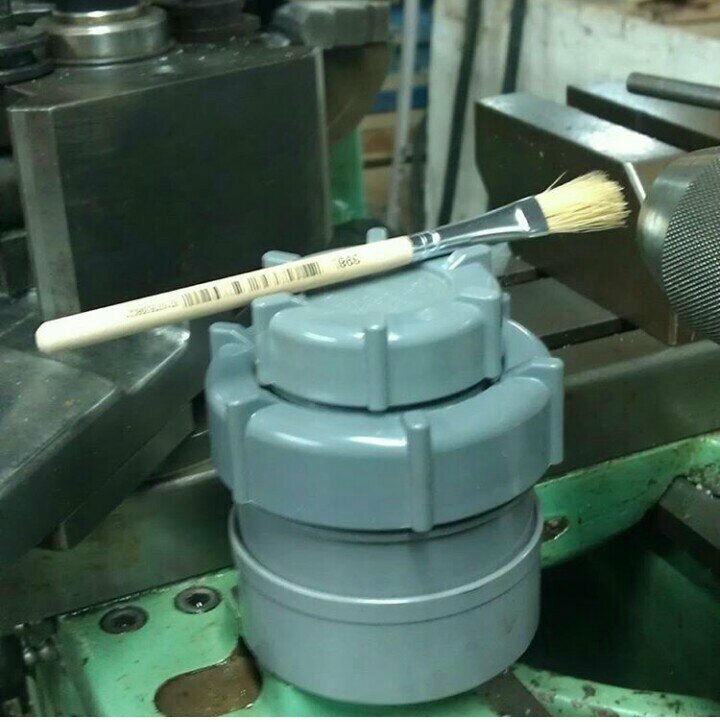 To much room and it wil still spil if tipped over and to little and you don't have much oil to dip your brush into. 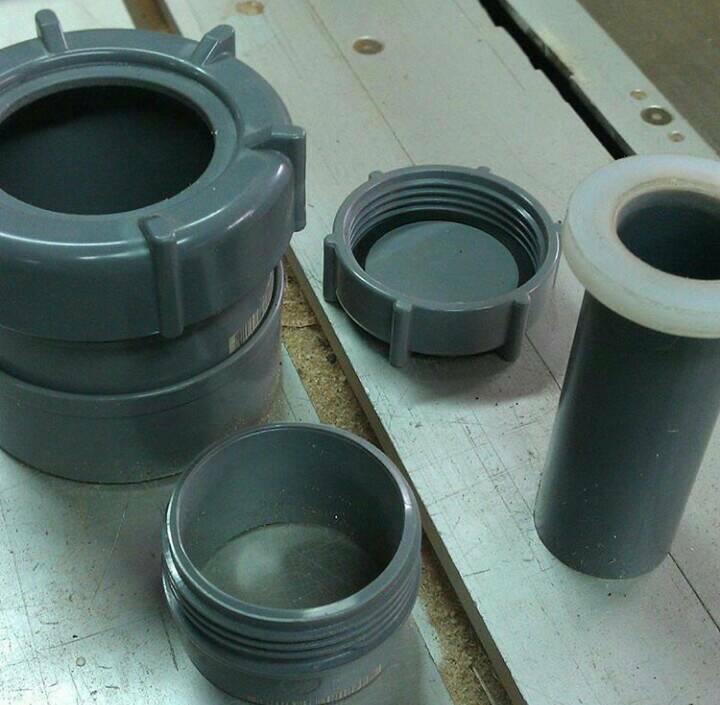 Almost all parts are PVC pipe fittings, with a little lathe work. Not a as much handcrafted as yours I'm afraid. The "tube" part is a bit wide, but it works quite well. I am going to try to make the second one with a narrower piece of pipe. Nice Peter, I have no problem with making a few of something as I give them away to friends. Got through a stack of tuna tins now and run out of copper fittings. The first copper fittings I had were of old design, not pre soldered. The newer ones are Yorkshire fittings with the solder ring inside them, not as nice to use. The fitting leaves a gap of about 8-10mm below it and I use the 9mm acid brushes, they pick up enough oil and catching the fitting edge on the way out removes the drips. Yes that's the stuff but you only need a couple of drops of it, not bath in it. Ah, fond memories of 1980s Liquid Paper, dissolved in 1.1.1-Trichloroethylene. Smelt heavenly... For some reason, Tipp-ex (which also used Trike) smelt terrible. Then they all went water-based, and took days to set properly. Oops, that'd be 1,1,1-Trichloroethane apparently (thanks Wikipedia). so... which one is "Trike"? Trichloroethylene or 1,1,1-Trichloroethane? Sorry, but my chem days were way in the past and like all common names I would bet "Trike" would be applied to both. Think of Biro which is applied to virtually any ball point pen or Thermos, Masonite, etc. Guess that is why the medical profession like to use Latin = less ambiguity or, heaven help us, try reading a legal document. All those 'hereinafter' and other strange words have been tested in court so the legal eagles know the legal meaning. Even if clear as mud to us. While I like the Tubal Cain idea, I took a different approach. When I have another container ready, I will make another one and annodize one yellow and one green for either Rapid Tap or A9.